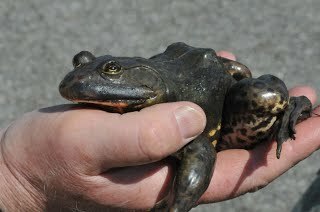 Background: The American bullfrog (Lithobates catesbeiana) is a non native species to the Pacific Northwest. It was introduced in the early 1930s and has been incredibly successful in many low elevation habitats in Washington and Oregon. While it plays an important role as a native in many eastern United States ecosystems, it is not as well loved here in the West. It is a strong competitor with a large appetite (eats most anything that fits into its large mouth), and as a result it is thought to be the culprit responsible for threatening many native species of flora and fauna. Adult and Juvenile Description: The dorsal side of this very large species can be green, tan, or dark brown and is covered by dark spots and blotches. It lacks dorsolateral folds and instead has a fold that extends from the back of the eye, around the ear drum, and down the top of the forearm. The eardrum, or tympanum, is very large and is a distinguishing feature located behind the eye. The lighter underside of the bullfrog can be off white to yellow and often has a dark marbling. The hind feet are fully webbed. This species is sexually dimorphic. Males are distinguished by a large tympanum that is twice the diameter of the eye, a yellow throat, and a large, swollen thumb called a nuptial pad. Females often reach a length of about 20cm making them overall larger than males. The tympanum is equal to the diameter of the eye. Larval Description: In the Pacific Northwest bullfrogs remain in their larval stage for up to two years. They can be up to 15cm long. They are olive green to a greenish-yellow with small black specks on the dorsal side and have a creamy color belly. Egg Description: Eggs are laid in large sheets of thick jelly that sit on the surface of the water. Eggs are bicolored with a light underside and dark topside. They are about the size of poppy seeds. As the eggs get closer to hatching, the jelly sheets tend to sink below the surface of the water. Habitat: This species is incredibly dependent on water, so it requires a permanent water source. It may be found along ponds, lakes, reservoirs, or in the backwaters of rivers. It prefers warmer waters. 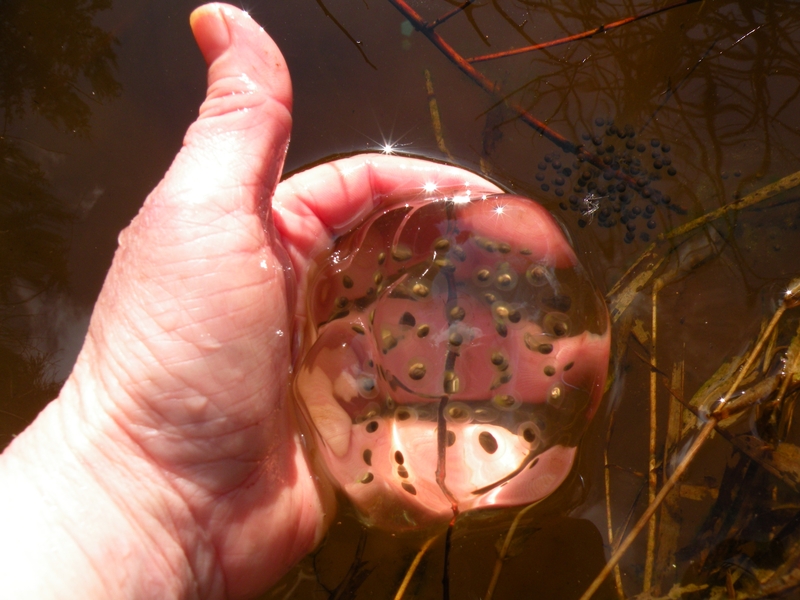 Tadpoles are usually found in shallow water with dense vegetation. Adults may be seen on banks and swimming among aquatic vegetation. Adults are leery of humans (and any other large predator), so often disappear before you can get a good look at them. You may, however, hear their loud, resonating calls during the spring and summer months.